Back in January, I blogged about a crafternoon in Asheville with my friend Stephanie of Darned Ideas. Darned Ideas is now a monthly Meet Make Take craft night (yay! 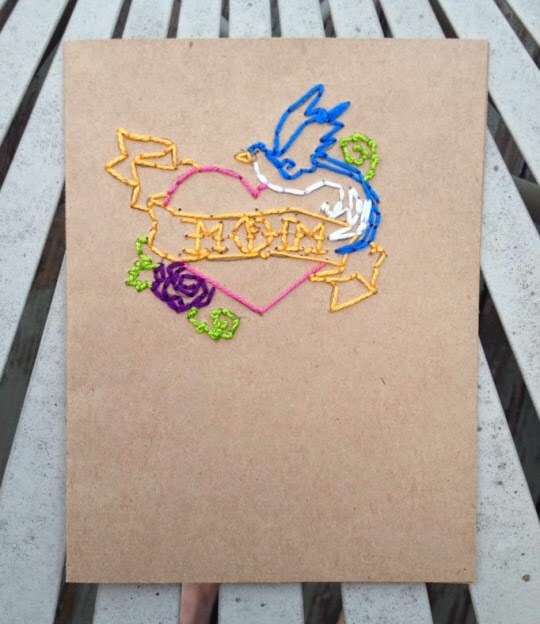 ), and one of my favorite projects to come out of craft nights is this mom tattoo card embroidered by my very own Alex. Lately I've been trying to complete projects that have been hanging around my craft room for a long time now. This cute little tree embroidery kit from Egg Press was the latest project on my list. I'm finding less and less time to craft these days (where oh where does the time go?! ), so quick projects are the only way to get my craft fix. In the spirit of quick crafting, check out my tutorial for crocheting lobster stitch this week on Craftsy. Lobster stitch is a cool crochet stitch that doesn't require you to decide the number of chains before you start crocheting. The stitch actually builds right off the previous single crochet, meaning you can make that cord as long or short as you'd like without having to decide in advance. As you can see, it makes a pretty rad bracelet. Pop over to Craftsy and get the lobster stitch tutorial! What kinds of quick craft projects are you working on? It's gonna be a busy summer!